US Open - From Michael Jordan's appearance to Serena Williams' redemption, here are 100 things we learned. NEW YORK -- The decimation happened so fast, you would have sworn the seeding supervisors were a little tipsy when the draws came out. Seriously, the two through nine seeds in the women's field were all ousted before the quarterfinals, leaving fans and media scrambling to figure out exactly who the remaining players were. But then something happened: Serena Williams won the title. But even she was a question mark coming into New York considering her flat Slam season. The top men's seeds, conversely, sailed through the crucible of this year's Open until ... Novak Djokovic and Roger Federer -- and their 24 combined major titles -- were booted from Saturday's semis by two double-digit seeds. The truth is, there really isn't such a thing as a seedings supervisor; the US Open draw is based on world rankings, but still, what in the world went down these past two weeks? The only thing that made sense the entire fortnight were the Bryan brothers, who, after a yearlong hiatus from the trophy presentation, won the doubles championship. Incredibly, it was their 100th career title, a milestone that likely won't be surpassed anytime soon, if ever. In deference to the greatest duo on the planet and their centennial mark, how about a look at the top 100 storylines from this US Open in ... 100 sentences. 1. Playing the very first match on Arthur Ashe Stadium this fortnight, Simona Halep dropped her opening set before recovering. 2. The No. 2 seed attributed her comeback to a motivational speech she gave herself during a bathroom break. 3. Venus Williams needed no such pep talks, but still required a comeback of her own against 43-year-old Kimiko Date-Krumm in her US Open first-rounder. 4. But Date-Krumm was the least of Venus' problems when you consider the rogue bee that terrorized their match and caused three modest delays. 5. The only thing that terrorized Andy Murray was his opponent, a game Robin Haase, who gave the Scot a run for his money on opening Monday. 6. But Murray rediscovered the bounce in his step and won in four rather unremarkable sets. 7. Speaking of bounce, His Airness, Michael Jordan, joined Roger Federer for a Round 1 prematch selfie. 8. He then watched the 17-time Grand Slam champ lay a whoopin' on his first-round opponent, but it was this shot that got MJ all giddy. 9. But with respect to these all-time greats, it was 15-year-old CiCi Bellis who stole the show on Day 2 by becoming the youngest Open winner since Anna Kournikova in 1996. 10. Bellis became one of 12 American women to matriculate to the second round in New York, the most since 2001. 11. Conversely, only three U.S. men made it past the first round -- the worst in the Open era. 12. This compared to the record 33 men the U.S. sent into the second round in 1984 -- which, apropos of nothing, was Michael Jordan's rookie season. 13. But the NBA icon has long since retired, as did six men's players in the opening round, which tied for the second most since the Open era began in 1968. 14. One player who didn't retire was Lleyton Hewitt, but after suffering a straight-sets loss to Tomas Berdych, the R-word rhetoric began. 15. Hewitt, though, maintained his career will go on for now, despite a career that has been going south for some time. 16. Unlike, say, Courts 4, 5 and 6 here at the USTA National Tennis Center, which, after yearlong renovations, were shifted 30 feet -- to the north. 17. In all, a total of eight courts were rebuilt for 2014, but that's not nearly as welcome as the 43 restroom stalls that were added. 18. In hindsight, a smart move considering more than 700,000 fans flock the two-week event, including the guy who heckled Stan Wawrinka during the Swiss' second-round match just before midnight struck on Arthur Ashe stadium. 19. But Stan, being the compassionate lad he is, said he understood because "at the end of the day, [the fans] start to get a little drunk." 20. And there is a good chance No. 4 seed Agnieszka Radwanska wanted to join the ranks of the inebriated after a stunning, lopsided loss to Peng Shuai in the second round. 21. A disappointed end for a player who was just coming off an inspired championship run in Toronto. 22. Just as disappointed was Sloane Stephens, who played uninspired ball in falling to 96th-ranked Johanna Larsson. 23. So while the Sloaner will have to wait until next year to come back, Tommy Robredo was busy making his comeback. 24. The irrepressible Spaniard clawed back from a two-set deficit against Simone Bolelli to win in five, which was, remarkably, Robredo's seventh career comeback, tied for the sixth most in the Open era. 25. Robredo is a paragon of fight, unlike, say, Michael Llodra, who retired for the 29th time against Philipp Kohlschreiber. 26. American Ryan Harrison might as well retire when it comes to playing the game's upper echelon, when, after losing to Grigor Dimitrov, he fell to 0-21 against top-10 players. 27. More misery for Harrison, who, unlike the teenager Bellis, is no longer in the forefront of U.S. tennis, but found time to warm up world No. 1 Novak Djokovic. 28. As for Bellis, her dream run finally came to an end, losing to Zarina Diyas of Kazakhstan, 6-3, 0-6, 6-2, though the home-schooled 10th-grader (who says algebra is her favorite subject) couldn't help but enjoy her experience. 29. Bellis' loss left only one teenager, 17-year-old Belinda Bencic, in the draw, which added to the young-gun narrative that has emerged this season. 30. Perhaps the whippersnapper with the most clout on the men's side was 19-year-old Nick Kyrgios (the guy who beat Rafa at Wimbledon), who crushed 22 aces to reach the third round. 31. Kyrgios gave the Aussies a lot to root for, unlike, say, 2011 US Open champ Sam Stosur, who suffered a 3-6 6-3 7-6 (8) loss to unseeded Estonian Kaia Kanepi. 32. But Slammin' Sammy was only a harbinger of the onslaught of upsets that were in store the first week, when you consider the fate of a certain Romanian. 33. Halep, the No. 2 seed, was beaten by 32-year-old Mirjana Lucic-Baroni, who is the very definition of journeywoman. 34. And then it was Angelique Kerber's turn to exit the premises after she fell to that precocious talent, Bencic. 35. By the end of five days, four of the top eight women's seeds were likely off on some island, wistfully thinking about what might have been. 36. In a shocking turn of events, four of eight became five of eight when a 21-year-old qualifier from Serbia, Aleksandra Krunic, completely wrecked Wimbledon champion Petra Kvitova. 37. It had been three years since this kind of anarchy ensued at the US Open, when five of the top eight seeds all lost. 38. And just when you thought harmony had been restored in New York ... No. 5 seed Maria Sharapova got the boot in the fourth round, by Caroline Wozniacki. 39. And what sweet redemption that must have been for Woz, who was on the receiving end of a very public breakup with Rory McIlroy just months before. 40. ESPNW's Jane McManus spoke to Woz's father, who said that since the breakup, Woz has been training like she did two years ago. 41. Woz was a big fan favorite at the Open, as was John Isner, though he saw his dream ended by Philipp Kohlschreiber for the third straight year in the third round. 42. Isner put up a solid fight, though for the first time in his career, he lost three tiebreakers in a single match. 43. That was better than the listless effort Sam Querrey gave top-seeded Novak Djokovic in a hasty three-set drubbing in the third round. 44. This all meant the U.S. men had nary a soul into the quarterfinals for the second straight season, something that had happened only once since this tournament began in 1881. 45. That 19-year-old Aussie hotshot Krygios, who after an auspicious start in New York, also failed to make the final eight after he was outclassed by Tommy Robredo. 46. Robredo, who is the one responsible for ousting Roger Federer in the fourth round a year ago, committed only 15 unforced errors, 32 fewer than his opponent. 47. But that was pristine tennis compared to the 52 unforced errors from David Ferrer, usually a model of consistency, made in a third-round loss to Gilles Simon. 48. Ferrer was overtly bothered by the microwave-like 85-degree weather that struck the US Open on middle Sunday. 49. The skies finally opened up a few hours later for the first time all fortnight, which was good news for Roger Federer, who was down 5-2 in the first set against Marcel Granollers when the rain struck. 50. Federer rebounded in typical fashion and crushed his Spanish foe 6-1, 6-1, 6-1 after dropping the opening set. 51. Federer attributed his dominance to more tranquil, albeit painfully hot and humid, conditions when play finally resumed. 52. But he wasn't nearly as hot as a focused Gael Monfils, who mauled his French countryman Richard Gasquet in three sets on middle Sunday. 53. For years, we've expected big things from Monfils, who was one of the all-time great junior champions, but to this point in his 10-year career has made only one major semifinal. 54. Not to be outdone, the teenager Bencic, who is also a storied junior champ, having won the French Open and Wimbledon titles last year, was still creating upsets by knocking off the No. 9 seed Jelena Jankovic. 55. Bencic, for the record, had played only one Grand Slam event (Wimbledon, 2014) before her glorious run in New York. 56. Turns out, she was the youngest player to reach the US Open quarterfinals since her coach's daughter, Martina Hingis, in 1997. 57. Bencic, is so young in fact, that she became the first player to win on Arthur Ashe who was born after the stadium was completed. 58. Although the whippersnappers tend to hoard the storylines, there were a few oldies that made noise too, like 53-year-old Todd Reed -- the oldest ball boy at this year's Open. 59. Reed is a retired undercover narcotics specialist who lost part of his right leg during Desert Storm. 60. And he's doing it all for eight dollars an hour, the meager ball-person rate. 61. Which would be a comedown for billionaire Donald Trump, who, as always, was a staple at this year's Open. 62. Andy Murray must have felt like a billion dollars after he thwarted Jo-Wilfried Tsonga in straight sets, the Scot's first win over a top-10 player (0-7 previously) since Wimbledon a year ago. 63. That win elicited more gender equality rhetoric with coach Amelie Mauresmo seemingly having a positive influence on the two-time Grand Slam champ. 64. Mauresmo has clearly done a wonderful job, as did Kei Nishikori, who squeezed by No. 5 seed Milos Raonic in five hair-raising sets in the fourth round. 65. That match ended at 2:26 a.m., tied for the latest ending in US Open history with two other matches. 66. During the marathon, Nishikori's feet understandably hurt as did his brain, but he nonetheless reached his second Grand Slam quarterfinal. 67. The Williams sisters likely had a good-sized headache as well after a straight-sets quarterfinal loss in the women's doubles. 68. And with the Wimbledon saga still in the backdrop, Serena took a medical timeout (gasp!) during the match, but everything was A-OK -- except for the result. 69. A bad day for the veteran Americans, as was it for the burgeoning CiCi Bellis, who lost in the second round of juniors, 7-6 (9), 2-6, 6-1, to Russian Natalia Vikhlyantseva. 70. But Bellis left the grounds with grace after a swift ride to stardom at the US Open, unlike Victoria Azarenka, who showed off her grouchy side. 71. When asked about her comeback after a recent spate of injuries, she retorted only in the way Azarenka can, saying, "You're making it sound like I went through, I don't know, that I almost died and, you know, there was 10 sharks and I got attacked and I survived." 72. Speaking of sharks, Greg Norman was in Grigor Dimitrov's box to watch the Bulgarian take on Monfils in an epically entertaining match. 73. But it was Monfils who was the big fish that day as he danced his way to a shocking straight-sets win to advance to only his second US Open quarterfinal. 74. The win must have given Monfils a serious sense of redemption as his fallen foe, Dimitrov, is coached by Roger Rasheed, Monfils' ex-mentor. 75. Dimitrov exits New York on a flat note, as did Sara Errani, the No. 13 seed, who was flattened by Caroline Wozniacki in the quarterfinals, 6-0, 6-1. 76. Woz didn't have to work too hard, unlike Marin Cilic, who earlier that day needed 4 hours, 13 minutes to quell Gilles Simon. 77. A sweet win for Cilic, who one year ago missed the US Open after violating tennis' drug policy earlier in the season. 78. Cilic can say one of his biggest claims to fame lies in the fact that he was one of only two palindrome players to reach at least the quarterfinals. 79. The other is "Bob" Bryan, of course, who along with brother Mike, was nearly eliminated in the final eight but fought back from a break down in the third set to win. 80. There was some serious brotherly love that day as the Bryans inched closer to their 100th career title. 81. Nearly as much love as there was for Cliff Drysdale, who on the final Wednesday received his International Tennis Hall of Fame ring in front of his ESPN family. 82. But it wasn't as joyful a day for another ESPN analyst, Patrick McEnroe, who resigned as head of player development for the USTA. 83. Under McEnroe, there was improvement in the farm system, although the greatest concern is the 11-year gap since an American man (Andy Roddick, 2003 US Open) won a Slam. 84. And for Victoria Azarenka, the gap will be at least two years since her last major win after she suffered a lopsided quarterfinals loss to Ekaterina Makarova. 85. The Russian reached her first-ever Grand Slam semifinal, as did the marathon man, Nishikori, who won his second consecutive four-hour, five-set win -- this time over Stan Wawrinka. 86. It was a painful win to say the least, unlike Novak Djokovic, who handled his longtime rival Andy Murray in four sets to reach the semis. 87. As did Cilic, who crushed Tomas Berdych in a weirdly one-sided affair in which the Czech barked at the chair umpire Lousie Engzell, but afterward admitted it was his bad. 88. Not as bad as the mental collapse from Monfils, who couldn't put away the great Roger Federer after taking a commanding two-set lead in the quarterfinals. 89. For Federer, it was his ninth career comeback from two sets down and his first at the US Open since his very first match here way back in 2000. 90. 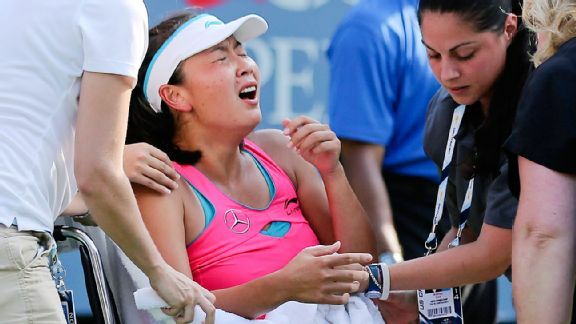 Ton of drama, but nothing compared to the scene on Center Court when Peng Shaui was forced to retire during her women's semifinal bout with Wozniacki after suffering severe cramps. 91. 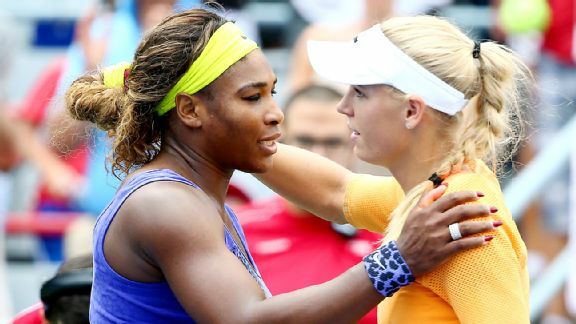 Unfortunate as the ending was, the win propelled the Dane back into the women's US Open final for the first time in five years, where she was to meet her bestie, Serena Williams. 92. But world No. 1 Djokovic failed to make it back to his fifth straight final in New York after Nishikori stifled the world No. 1 in four sets. 93. Nishikori, a player with limitless potential, became the first Asian-born men's player to ever reach a Grand Slam final. 94. And Cilic became the first Croat to reach a major final since his coach, Goran Ivanisevic, at Wimbledon in 2001 with a straight-sets demolition of Federer. 95. Upset semifinal Saturday set up the first championship between two first-time Slam finalists since Rafael Nadal played Mariano Puerto in the 2005 French Open. 96. But it sure wasn't the first final for the Bryan brothers, who rolled to a straight-sets US Open title, their 100th overall championship. 97. Nor the first final for Serena Williams, who beat Wozniacki in two quick sets to win her sixth US Open and 18th overall major, tying Chris Evert and Martina Navratilova. 98. For Cilic, it was his first major championship after a dominating straight-sets win against Nishikori. 99. And for the record, all five sets of the two singles final matches in New York ended by the count of 6-3. 100. But the more impressive number was $3 million -- the money Cilic pocketed for one perfect fortnight.